Castle Dice plays in exactly 7 rounds. 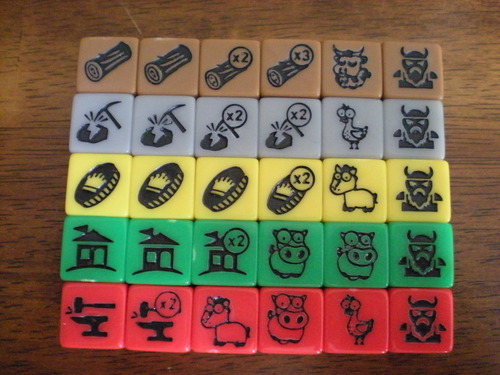 Each round, players are rolling dice and drafting them as resources ( to hire villagers / build the castle ) or animals ( provide in-game abilities ) or if they are unlucky, barbarians will come to raid their village. The dice in Castle Dice are all custom made and come in 5 different colors. Each color corresponds to a particular resource in the game; but they also feature a side with a barbarian icon and from 1-3 animal icons. This continues for 7 rounds, after which, all points are totaled up and the player with the most points is the winner. Points are obtained via cards that the players have built ( mainly Castle Deck cards ), via Market Cards, and from having the most animals and villagers among all the players. But of course, let’s not forget about the most important part of the game, the animals’ and villagers’ abilities ! I kind of lean towards a preference for drafting in games. Castle Dice would be a rather bland game if not for the abilities that the Animals and Villagers bring. And though the abilities are rather simple, I think it may end up gelling well within the game and it won’t scare away light gamers. That’s a big plus. 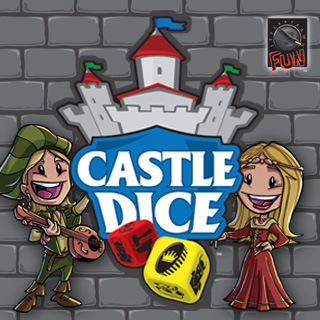 The art of Castle Dice falls into the area of like for me and I think it suits the mood of the game well. It may be cartoonish, but I think for a quick light game, that is about perfect. The randomness of the dice not only makes each game different, but the barbarian mechanic is pretty neat as well. Each time a barbarian is rolled, it reduces a die from the world pool. So if you were planning on relying on a particular die option coming out, or at least maybe enough dice to collect 3 or 4 per round, you may end up disappointed with the reaps. I can imagine it may be quite harsh to roll multiple barbarians, but at least they attack after the build phase, so with proper planning, it can be mitigated. Some of the cards provide one off abilities when gathering or rolling dice. I tend to like that in games, though balance is always ( always ) a problem. Hopefully Castle Dice doesn’t suffer from card balance issues. Can’t be sure but the problem does exist especially if the card abilities are not balanced. I don’t have a picture of the box to show you but that box is unnecessarily huge. I believe half the box is air which irritates me to no end. It might be space for expansions but really, everyone should employ the Quarriors style boxing. Big boxes for the expansion, not the base game when no expansions are in sight. Thank You. Not sure how the replayability will be like. Seems like a simple game which could mean that it might end up samey samey after a few plays. Sure the dice rolls make the game different, but in essence, you’re kinda doing the same thing each game. Hopefully I am wrong. Managed to secure a second hand copy since it hasn’t officially been released at stores. Just wanted to say that I think Luke ( the designer ) is a stand up guy. I had some difficulties in getting a brand new copy from Fun to 11 though, but I won’t say much about that. True indeed, I will try to read the rule of the games i intend to buy ........ I learn it the hard way ...... bought somegames without reading the rules and don't know much of gameplay....... arrrrggghhhhhh the money used to buy the games is more or less wasted! Now I really try to read up the rules before buying any games.